Two people have been arrested for allegedly racially abusing a Motherwell player ahead of the Fir Park side’s Ladbrokes Premiership match with Hearts at Tynecastle. Visiting player Christian Mbulu, who was an unused substitute during the match, was targeted as the teams performed their pre-match warm-up routines on the pitch. Video footage which shows as many as 20 fans in the stadium’s main stand shouting comments at the 22-year-old has been handed over to Police Scotland. Hearts told BBC Scotland that they were aware of the incident and were “cooperating fully” with the police. 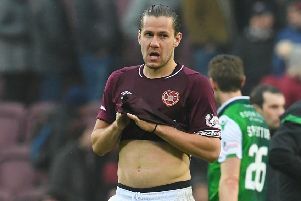 A statement from Hearts added that the club “abhors racism and all forms of abuse, and the individuals in question will receive indefinite bans from Tynecastle Park”.